Accepting random connection requests on LinkedIn can be a bad idea, but thankfully it's simple to break bad connections. Here are two simple ways to remove connections on LinkedIn. The individuals you connect with on LinkedIn directly influence your experience on the site, and those connections can affect the respect you receive from colleagues in your field. The best LinkedIn connections carry a certain cachet (or at least a perception of cachet) that raises your own status. However, connecting with the wrong people can be a total drag. We've all regrettably connected with someone — it's usually a person we haven't met or heard of — who breaks all of the LinkedIn Rules of Engagement. Thankfully, you don't have to stay connected to anyone who disrespects or annoys you with spam, impersonal messages or other random noise, and there are at least two easy ways to ditch bum connections. 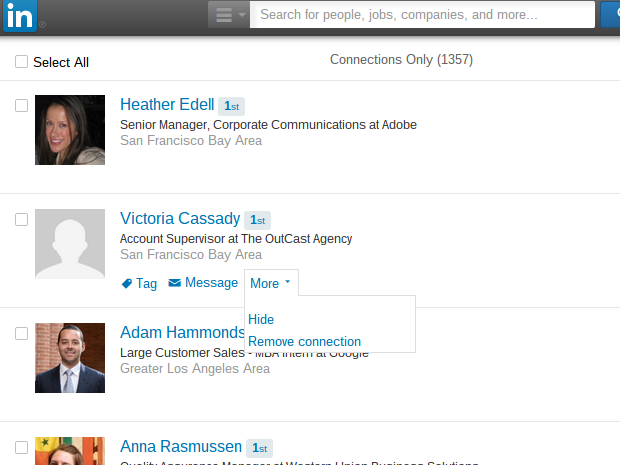 The most direct way to remove a LinkedIn connection is to click the "Connection" tab, which sits atop every LinkedIn page, to reveal your connections directory. The directory includes all of your LinkedIn connections and also shows every contact you've synchronized with your LinkedIn profile using other services, such as Gmail, Yahoo or Outlook. (LinkedIn connections are not the same thing as contacts, and you're not necessarily connected to someone even if they're a contact.) You can toggle between lists of "All Contacts" and "Connections Only" by clicking on the "Filter by" dropdown menu at the top of the directory page. After you find the individual or group of people you hope to never hear from again on LinkedIn, you have two options. You can click the check boxes that appear to the left of their profile images and names, then click the "More" dropdown menu at the top of the list and pick "Remove from Contacts." Or, to remove a single connection, you can hover over the individual's name and profile information in the list, click on the "More" dropdown menu and select "Remove connection." After you choose to remove a connection, LinkedIn shows you a popup box that provides one last chance to change your mind. Click on the blue "Remove" button to proceed or the gray "Cancel" button if you're having second thoughts. 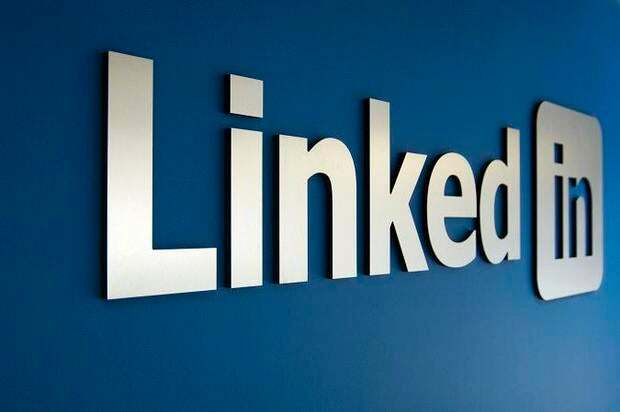 LinkedIn also specifies what will be lost if you remove a connection, including relationship notes, the ability to send messages, notifications about that person's updates and shared content, and all previously exchanged endorsements and recommendations. 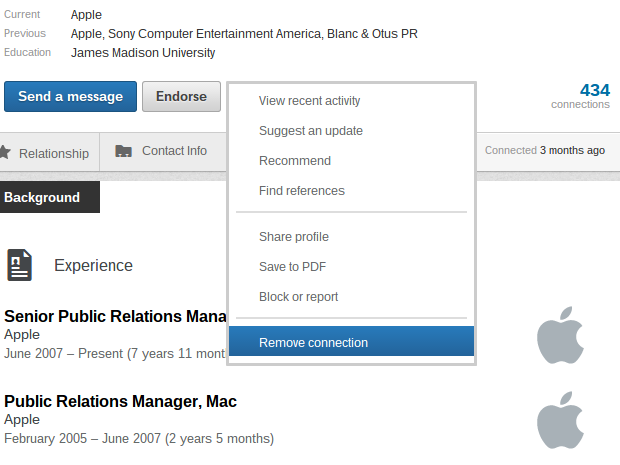 You can also remove LinkedIn connections while viewing the contact's profile page. This method is helpful because it's intuitive for many users. While viewing a connection's profile, hover over the downward-facing arrow next to either the "Send a Message" or "Endorse" buttons and click "Remove connection," then click the "Remove" button in the pop-up window to confirm the decision. It's that simple, and after you remove unwanted LinkedIn connections, you can get back to enjoying the benefits of the service without being weighed down by all the noise.